Matthew Rawn has been winemaker for Two Mountain Winery since its inception. He helped plant the estate vineyard with his uncle Ron Schmidt in 2000 and has produced Two Mountain’s wines since the first vintage in 2002. While the vineyard was developing, Matt honed his winemaking skills by working alongside neighboring Yakima Valley wine producers and learning their craft. A passionate advocate for the Washington wine industry, Matt manages sales and marketing for the winery and enjoys talking with wine retailers and restaurateurs about the state’s world-class wines. Matt graduated in agricultural business from Montana State University in Bozeman and has completed courses at the enology and viticulture, at Walla Walla Community College in Walla Walla, Washington. Braden began his career with Two Mountain pulling weeds in the yard and labeling wine when he was barely 17. Shortly thereafter he began asking a lot of questions about wine making, cellar techniques and vineyards and we started giving him more to do. During his senior year of high school he decided he wanted to pursue wine making as a career. That harvest, while he was starting oenology courses at Yakima Valley College, he became our first harvest intern. The rest is history. He crushes it in the cellar and is generally a rock star at all he does. Karolyn was introduce to Two Mountain by a friend of a friend in June of 2018; she just happened to fit right in. Karolyn has since fell in love with wine and spends her time learning everything there is to know about making, selling, growing, and of course drinking great wine. When she is not in the tasting room, Karolyn is hanging out with her boyfriend Kyle and sweet little pup Riley. Eliceo manages the vineyard crew. He has been running the Two Mountain vineyard crew since 2009. Eliceo is a level three graduate of the Latino Viticultural Education program at Yakima Valley College. In addition to running our crew, Eliceo also serves as pastor at the Monte de Sion church in Sunnyside and father to three very busy and awesome children. 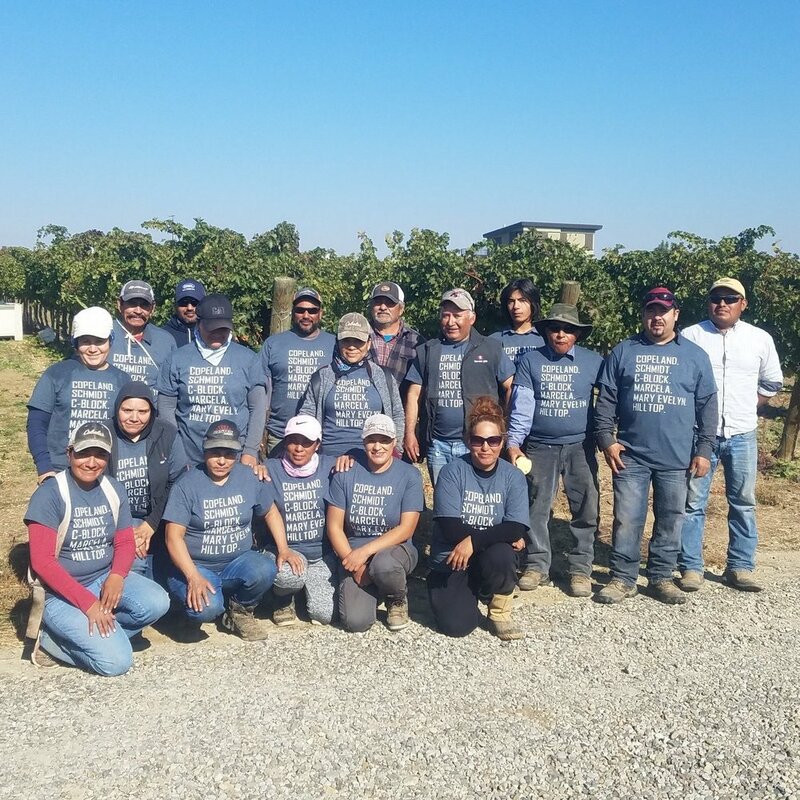 Nothing happens without our amazing vineyard crew. Susie McFerran joined Two Mountain Winery in March 2014 to assist in the daily operations of the tasting room including Wine Club and events. She has an extensive background in outstanding customer service and hospitality. Before joining Two Mountain, she previously managed another tasting room and previous to that was with Macy’s for nearly 20 years. She also has her cosmetology License, but prefers promoting outstanding Washington wines and developing lasting relationship with wine club members. No one can resist her infectious smile, extensive product knowledge and extremely outgoing personality. Susie is married with three children. When she’s not at the winery you can usually find her lending a helping hand to others. She loves spending time with her family whether it be camping, skiing and leisurely fishing trips with her husband Jim. Aside from that, her real passion is traveling to tropical locations and relaxing on the beach or pool side with a cold cocktail in her hand! Adelfo started during the 2010 harvest. Adelfo’s work ethic and talents quickly shined bright. He is currently learning the management side of the vineyard. Adelfo is a level two graduate of the Latino Viticultural Education program at Yakima Valley College. In addition to managing our equipment operations, he has his own 16 acre Bartlett pear orchard in Yakima. Efren has served as the president of the Yakima School District Migrant Parent Teacher Association for eight years, advocating both locally and nationally, for the educational needs of migrant students. Looking for the best tamales in the hemisphere? Look no further than Efren’s wife, Edinina. Marcos has been working with our family in the tasting room for a year, but he has roots in the food and beverage industry going back two decades. Marcos was born and raised in Yakima, Washington and began pursuing his passion for beer and wine in the early 2000’s as he backpacked through Europe. His learning experiences in Europe with beer and wine were hands-on and transformation. Marcos’s passion for beer, wine, art, and music led him from Europe to Seattle to work as a custom art framer and then to PCC Community Markets, where he worked for six years. At PCC, Marcos’s enthusiasm and knowledge for beer and wine grew exponentially, and his particular passion for Washington wines wound up leading him back home to wine country. Currently, Marcos loves learning about wine, making music and art, engaging in target practice at the local shooting range, and traveling with his fiancé Rachel. Jessica joined the Two Mountain team in June of 2018. Turns out that after 10 years of teaching, you just need some wine. Jessica, her husband Lee, and their two boys moved back to Washington after five years in South Carolina. They are thrilled to be back to their Washington roots and could not be happier spending days among the vines.